Put more than spring in your sit. Tired of getting rocketed out of your height-adjustable office chair every time you stand up? Tired of cranking-up the height to silly proportions just so you can rest at a not-so-silly eye-level with your work? 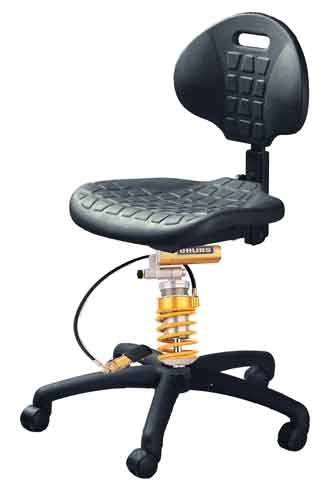 Introducing the new FortCo Adjustable Captive Progressive-Spring Gas/Fluid/Shim/Valve Damped Office Chair! Utilizing existing cutting edge, championship-winning technology, the FortCo "ACPSGFSVD" Chair brings safety, convenience and throngs of screamin fans to YOU! Overall chair height is set using an adjustable lower shackle and a convenient remote hydraulic preload adjuster. Damping is set using screwdriver-turnable adjusters. One atop and one at the bottom of the shock body to precisely dial in high-speed and low-speed compression damping as well as high-speed rebound damping. Further tuning can be accomplished by replacing the primary spring with springs of varying spring rates to accommodate users of varying weight, sitting style and office terrain. No more vaulting over the cubicle walls every time you stand up and no more climbing ladders to get back in the saddle! Are not the mechanical adjusters a little, well, crude ? High end passenger vehicles have long been equipped with "memory" seats. What is needed here is an office chair with servo-controlled parameters and a USB interface. Better, using a network, it would be possible to ensure that any chair you sat in immediately adopted your personalised settings. Try calling the Sirius Cybernetics Corporation, they love stuff like this. You're absolutely right. After all, even BMW motorcycles wound-up with computer-controlled suspension! I quite enjoy the pogo syndrome effect. What you do in the privacy of your own home is of no interest to us. Ohhhh Uhhhh Wow, you have unbelievably brought to fruition my dream of "Claire's Chair". That is exactly what I was thinking of. I'll post a self-serving link so you''ll know what I mean. Glad to help! The only time MY cat ever saw an office-type chair, he threw up. Maybe I was spinning him too fast and laughing too hard.